Big news! I am wearing a polar fleece in my kitchen. So what? it's winter, some of you are saying. But we have had an 8 months long summer here folks, so this is a blissful change. The sky is blue and cloudless, a breeze is blowing and it is wonderfully refreshing. There are other things in my kitchen apart from a fleeced-up blogger. In fact, it has been a bit of a crazy month here, and I seem to have acquired a few new things. I first had this when my cousin sent it up for my birthday last year. I had to buy more when I ran out. It has chilli and cayenne pepper in it, and it is deliciously HOT. I like it over vanilla ice cream; the contrast between cold temp. and hot spice is delicious. Our Iranian friend made us a beautiful rice dish with barberries which we loved. I am planning to use the wonderful saffron she gave us and these barberries in a similar dish. This photo sorta looks like Matt and I are holding his book together don't you think? 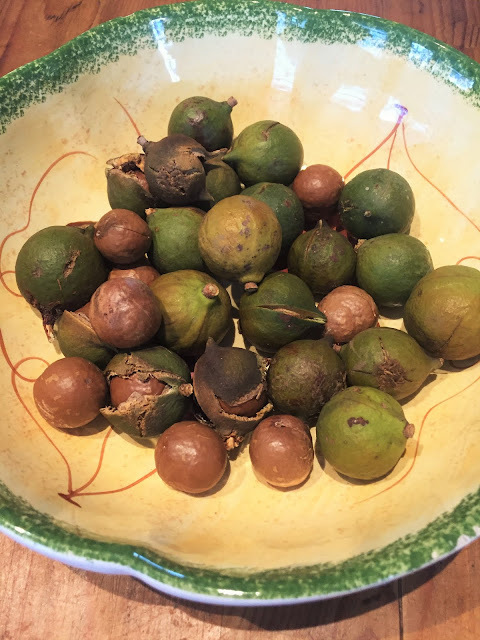 A lot of the recipes are meant for colder climes so it may not be practical for my sub-tropical kitchen, but who cares? Don't we all love him anyway? And then there is Gizzi. I know almost nothing about her, but this book was on sale so I nabbed it. You simply can't resist that Audrey Hepburn look! I love all sorts of vinegars and usually have several different ones on the go. We were at a local café recently which has a provisions store also. I saw this and it came home with me. 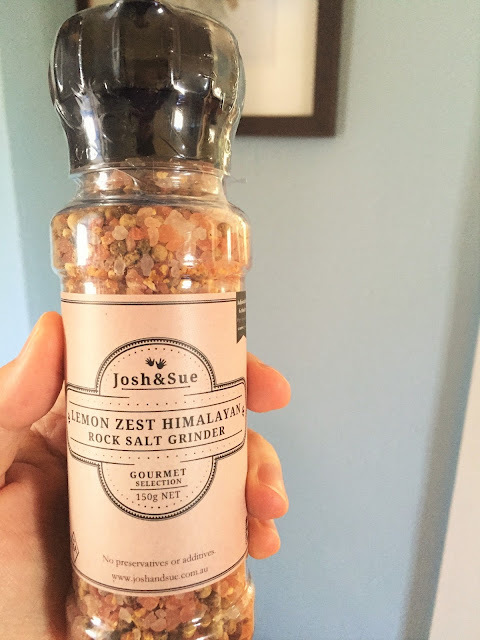 Delish on salads. Mr P. and I did some more foraging. I know they look a bit awful, but you need to leave them dry out for a while. The husk then shrinks and starts to come off making it much easier to get the nut out. We loved rootling through this big box of goodies as surprises kept popping up, including this very cute earthenware pot. It can be used for cooking apparently. Too cute to put in the oven! It will sit nicely on my shelves looking beautiful. I hope the lovely Olena did not spend too many of her hryvnias on this package. :=) Yes that is a new word for me too. I am guessing folks that you may not have known the currency of Ukraine either. We tend to use liquid soap in our bathroom, so I have put this in my underwear drawer to give a beautiful aroma to my smalls. 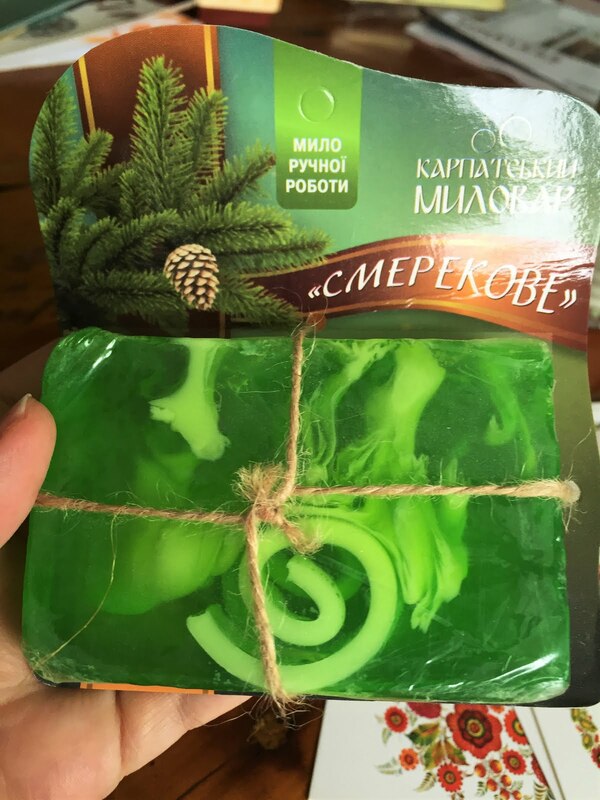 The funny thing is when I started to take off the wrapping, the soap was so greasy that I just punctured the whole thing many times (like a frenzied axe murderer) so the aroma comes out and the grease stays in. Perhaps they still use goat's tallow and ashes like the Phoenicians? 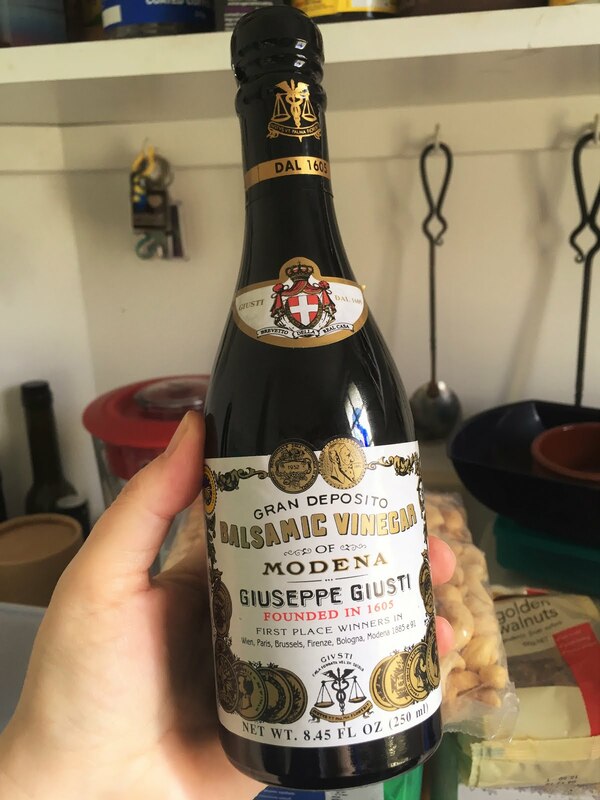 Every year, or at least those years when there are olives on Patrice's farm, I buy a box of her oil. 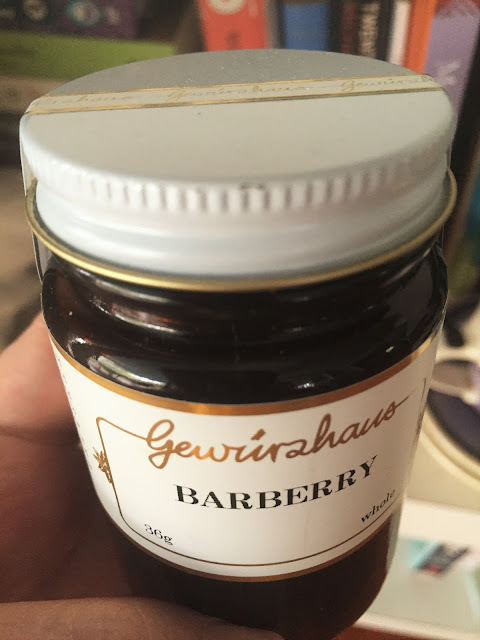 You have to get in quick 'cos they sell like hotcakes (I think the Sydney chefs use it in their restaurants). 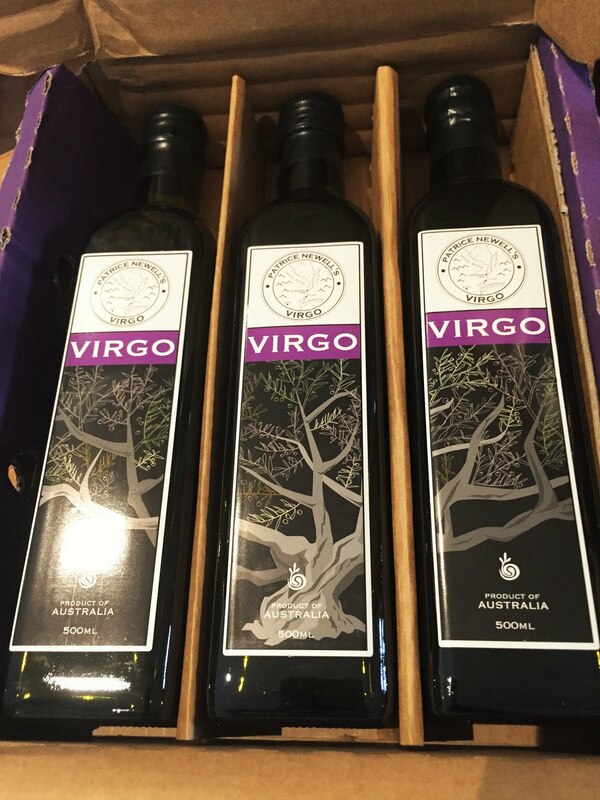 It is great to support Aussie farmers and to use oil that has only travelled interstate not halfway across the world. I had a drama with this, as some people may have seen on Instagram. Australia Post ran over my parcel! The lovely suppliers sent me a replacement without a quibble, unlike Aust Post. Have you ever tried to make a complaint with them? Don't bother, you have to sell your firstborn, AND your second born. Josh and Sue sent me this rock salt in my replacement parcel after the terrible tragedy of being run over by Aust Post. The parcel, not me. Thanks guys! 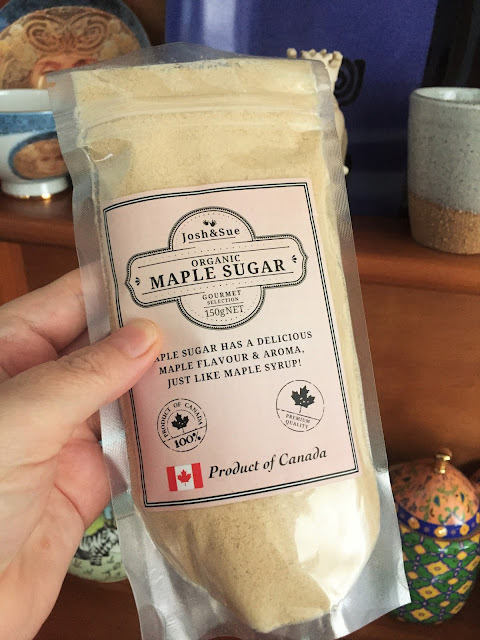 This maple sugar is apparently twice as sweet as normal sugar. I will have to investigate further. Well, that isn't everything that came my way this past month but I don't want you falling asleep as you try to get thru this post. Join in with Maureen from The Orgasmic Chef in this monthly show and tell of our global kitchens. That Ukrainian package was such a lovely surprise. 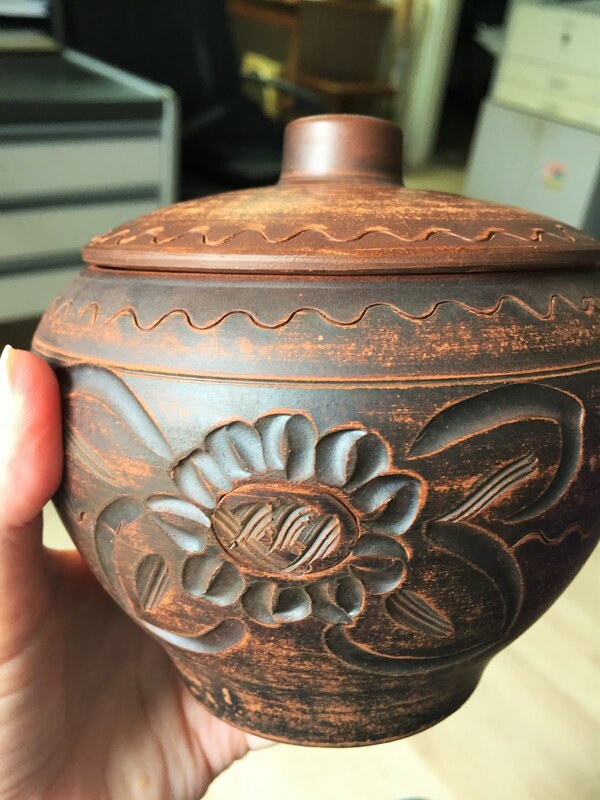 There was heaps of other stuff in it too like lots of chocs and a mug and a hand carved wooden pot etc. so sweet of her. So many wonderful ingredients in your kitchen Sherry, love the sound of the Mayan Chilli Chocolate and the maple sugar. What lovely gifts to receive in the post... so thoughtful of her. 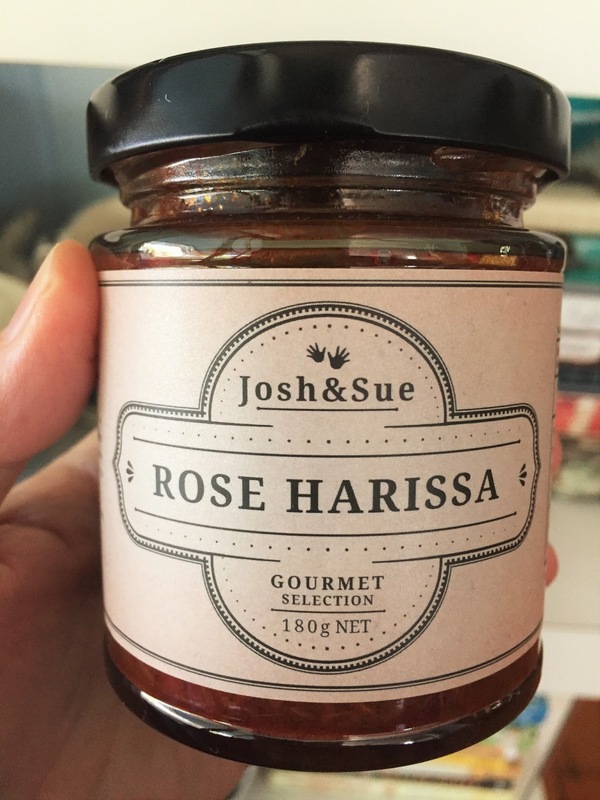 The rose Harissa sound delicious... is there a strong flavor of rose in this condiment? Hi Sherry. Great things you have in your kitchen. that picture of Gigi is hilarious. 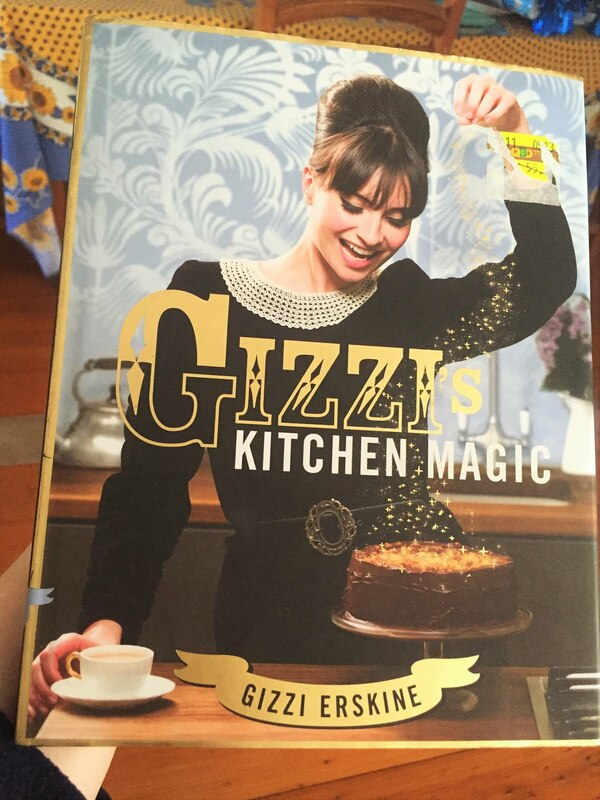 Wonder what the recipes will be like. It sure doesn't surprise me Australia post smashed your salt they are hopeless. have a great June Sherry. thanks. i have to say to be fair that i have only ever had 2 smashed parcels in all the years i have been buying online:=) and both times the suppliers were happy to replace them. unlike Aust Post!! the convoluted process to get a refund is virtually impossible- clearly they make it that way the sods. 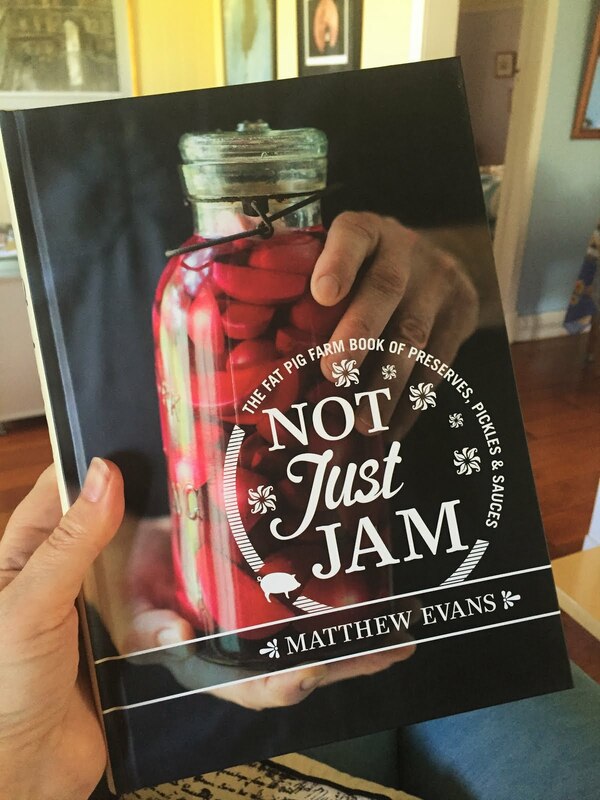 Wow, your kitchen is rocking new flavors, treasures and treats, despite the Australian Post which sounds demon difficult to deal with. Here the USPS favors drop-kicking fragile packages and UPS likes to deliver to strange not-mine addresses. Once Canadian Customs adopted a boat repair part and held it captive for a month in their warehouse. It all makes for good stories, if frustrating at the moment. Aust Post have been pretty good to me over the years. only twice in many years of online buying have i had a problem. the broken parcel had fragile written on it. i think that is always like a red rag to a bull. they just have to break it! 'Twas freezing up in maleny today with the cold wind. We love it! Great stuff in your kitchen, Sherry. 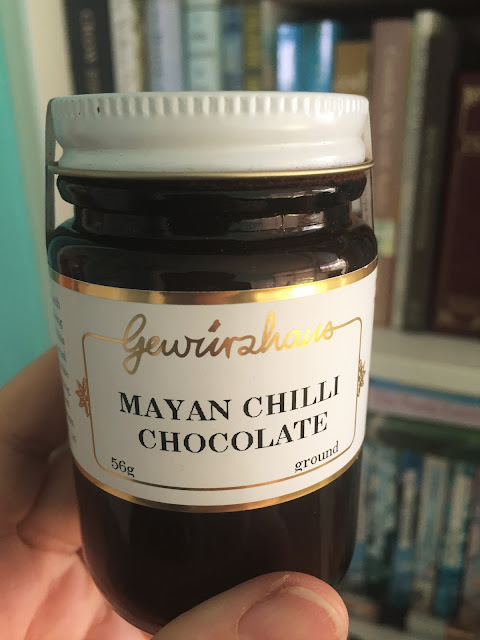 Love that Mayan chilli chocolate. I tried one of hottest chilli essence drop in a coffee last year in South Africa. Enjoy cooking the barberries and saffron. I have them in my pantry and been using them in Arabic rice dish. Put barberry in juice too! Adore how you support the local olive grove. thank you! nice to see you here. yep the chilli choc powder is wonderful. and i love barberries and saffron. a great combo with rice etc. Yes I gave up Charlie. It was all just too hard which clearly is their intention. Wow! Such a treasure trove of goodies in your kitchen this month! thank you louise. i had a really fun month! so much happening. shame about the smashed up parcel. it was completely flattened.! thanks Kim. lovely to see you. yes i had a fun month with so much happening. 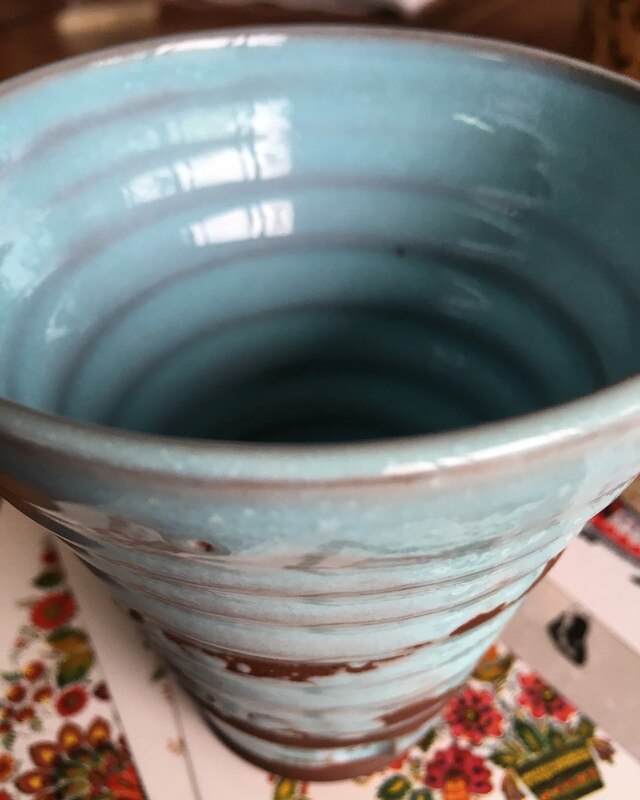 i really love the little pottery cooking pot- just so gorgeous. Wow - there's a lot in your kitchen this month Sherry. That Ukrainian chocolate is adorable but does it taste, well, a bit Ukrainian? You know, like chocolate but only just? 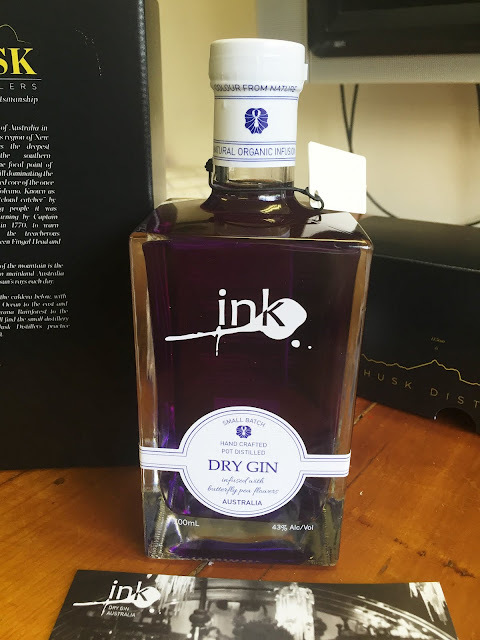 Yes, stop spalshing that gin about on social media. Now I have to get some and am on the case since you first shared it. cheers! You will love that gin fiona. so floral. 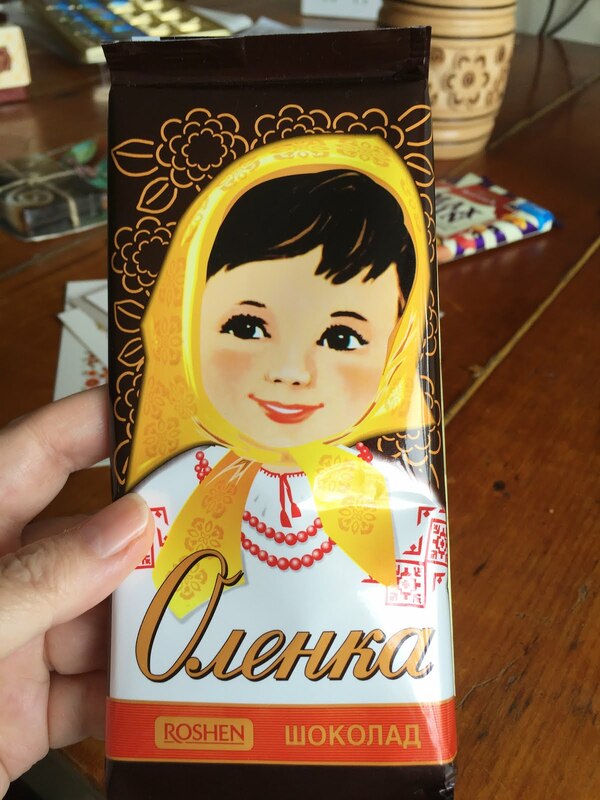 the chocolate was very Ukrainian i think. 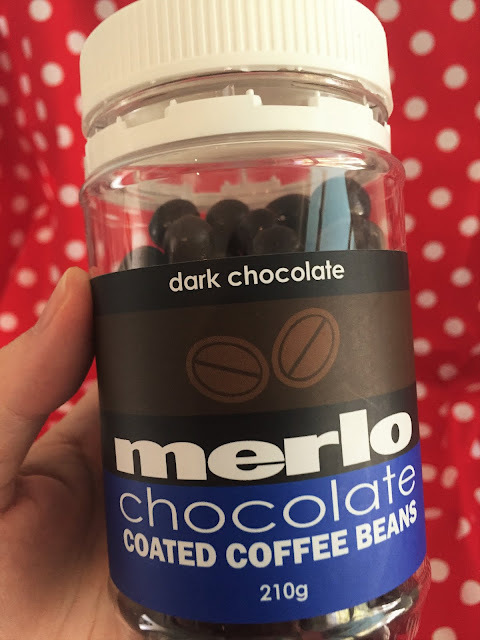 i loved the dark chocolate cherry liqueur ones- so good.